Dani Pedrosa will find out the result of a Bridgestone investigation in Jerez this weekend after the Spaniard managed to claim a podium finish in the Japanese GP, despite serious front tyre wear. An immediate investigation was launched after the Repsol Honda rider finished third in the Twin Ring Motegi clash, despite problems with his choice of medium compound front Bridgestone tyre. 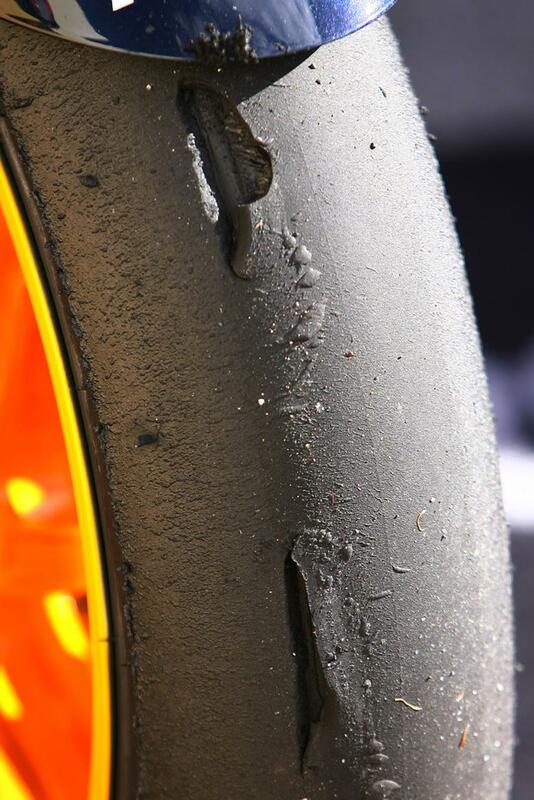 Pictures showed the triple world champion’s front tyre was badly chunked and Tohru Ubukata, Bridgestone Motorsport’s Manager of Motorcycle Race Tyre Development, said: “We did see some problems with Dani Pedrosa’s medium compound front Bridgestone tyre after the race. "All the other tyres that were used during the weekend, and this season, performed well so we can say this is a problem isolated to just this one tyre, but of course we have already taken the tyre to our technical centre in Tokyo where we are investigating the problem in detail. It is known that Honda also had severe front-end tyre issues during the first race in Qatar earlier this month. Pedrosa slipped back from sixth to eventually finish 11th, while Repsol Honda team-mate Andrea Dovizioso had to settle for fifth after initially running in third. Honda bosses told MCN during last weekend’s Twin Ring Motegi race that one of the big problems with the 2009 factory RC212V was its heavy wear on front tyres. Both Pedrosa and Dovizioso have also complained of the bike having balance and weight distribution issues, which have contributed to aggressive wear of front and rear tyres.